If you’ve been heading out to the south parking lot, the ball field or tennis courts, you’ll notice that there’s construction going on around Jo Ann Sharp Circle Drive. You might even notice that there’s concrete being poured and smoothed over. And before you know it, a sidewalk will be born. The pathway is part of a project — in phases — to create a safer pedestrian walkway to the main buildings on campus, adding access to main campus. 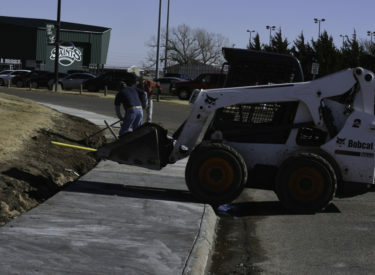 The new pavement will connect the parking lot to the Shank Humanities Building and the Hobble Building, and later be extended to reach the forthcoming Colvin Family Center for Allied Heath, gym and the Student Union. Eventually, the plan is to have sidewalks paved completely around Circle Drive.